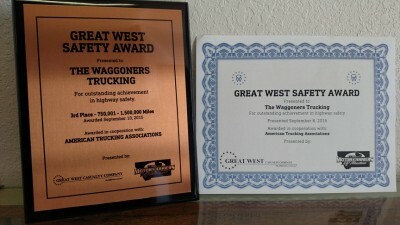 The Waggoners Trucking was awarded 3rd place in the 750,000 – 1,500,000 miles category for safety at this week’s Montana Motor Carriers convention in Missoula, MT. We were also presented with a certificate for accident-free operation. These recognitions would not be possible without our dedicated drivers and staff. Thank you!